Sometimes, the name behind the movie marquee says it all. 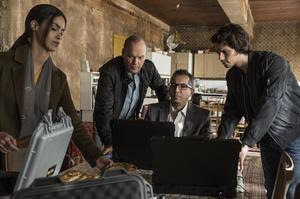 That’s why I was excited to see Michael Cuesta’s “American Assassin,” a film that gives Michael Keaton a shot at being an action hero in the Liam Neeson-led “Taken” vein. Cuesta did a great job with the Jeremy Renner led true-life tale “Kill the Messenger” in 2014 so I was looking forward to seeing this one. The lead in “American Assassin” is Dylan O’Brien as Mitch Rapp, who witnesses his fiancees’ murder. His character reports to Michael Keaton’s Stan Hurley, who still has some pull because of his success on past missions. The film works because the audience feels a kinship with Rapp, who for all intents and purposes just wants vengeance for the death of his fiancee. Rapp risks it all to see his fiancee's killers perish by extreme prejudice. Keaton, coming off as part of the ensemble cast that was “Spotlight,” brings a certain gravitas to Hurley. His motivations are just right, even when he faces torture by Taylor Kitsch’s malevolent Ghost persona. Hurley just shrugs it off because he taught the Ghost everything he knew. It was weird seeing Kitsch in the antagonist role since he previously played heroes in a number of flicks including “Battleship,” director Peter Berg’s guilty pleasure fiasco of a film. Kitsch also starred in Oliver Stone’s “Savages,” in which he shared great chemistry opposite of Blake Lively and Aaron-Taylor Johnson. Lest we not forget “John Cater,” the Kitsch vehicle that cost Touchstone Pictures a healthy bit of change on their end-of-the year books. Going back to “Assassin,” the film features a plutonium subplot that actually makes a water sequence plausible in the suspense department. As I have said previously, the studios have not found a way to make water sequences suspenseful in the very least. The only water entries worthy of mention are Steven Spielberg’s classic, “Jaws” as well as the cliched disaster movie “The Poseidon Adventure.” Everything else is “so-so” in my book. Also important to the plot is Sanaa Lathan. She portrays Irene Kennedy, Lathan’s boss. Lathan shares some good scenes with Keaton. Their banter a nice little tidbit to the film. “American Assassin” is not a must see by any means, but worth the price of admission for the water sequences alone.